Reading and writing assessment tools, built upon gamification strategies, encourage students’ reading, and enable teachers to easily assess comprehension and track progress. Quality and Effectiveness: Learn2Earn’s Whooo’s Reading platform is dynamic and built upon solid gamification strategies to encourage students to read more thoroughly, think more critically, and write more reflectively. The site’s visual theme is owls, and every user has a unique “owlvatar” (owlavatar). While Whooo’s Reading does not provide content, it does provide a library-sized database of book titles from which teachers can choose, to offer to entire literacy classes or individual students. Teachers can set goals and create or modify rubrics to help students make progress. Whooo’s Reading also provides over 75 standards-aligned comprehension questions that teachers can use or adapt so students can demonstrate what they’ve learned. One of Whooo’s Reading’s unique features is an option to add mentors, such as family members, so students can benefit from external support communities. Ease of Use: Learn2Earn has bright, intuitive, easy-to-use dashboards for both students and teachers. Teachers can manage all classes from one dashboard that includes clearly labeled menus (such as Turn-In-Tray, Student Roster, and Select and Edit Questions) and buttons (such as Class and News Feed). Student dashboards include Reading Streaks and All-Time Stats (number of books read, minutes spent, and “coins” earned), plus prompts for how many points they need to reach the next reading level, so it’s easy and fun to stay engaged. Support materials for teachers and parents are also available and include brief video explanations, blog-type entries for quick skimming, and short lists for guidance. Creative Use of Technology: Students can submit reading responses in three different ways to earn Wisdom Coins and badges. They can answer a question, write a review, or write a blog post. Students can record spoken responses for teachers to assess, which is particularly helpful for younger students and students with learning disabilities. Students can spend Wisdom Coins to personalize and animate their owlvatars. The overall clean design includes boxes to fill in and big buttons to submit responses; teachers can comment on student responses and students can resubmit to earn more coins. Teachers set reading expectations per class and per individual student. Teachers can also easily switch their dashboard to a specific student’s dashboard, which is useful if a student is having any difficulty. Teachers may also opt to open the online discussion to the whole class. 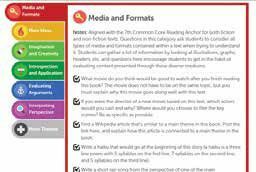 Teachers have access to over 4,000 questions written by teachers for use with popular books. Over 75 general questions are organized into categories that match Common Core State Standards, ranging from comprehension and inference to interpreting perspective, evaluating arguments, and media and formats. This well-designed Web site with gamification features helps to motivate students to read and improve their comprehension skills and enables teachers to easily assess comprehension, track progress, and personalize instruction. • Whooo’s Reading provides teacher-written question banks and solid assessment tools to support teachers in the important work of keeping students engaged in reading and writing processes. • Students respond favorably to gamification strategies, including earning coins that they can spend on personalizing their avatars. They also enjoy communicating online with others in class and beyond. • Whooo’s Reading makes it fun, easy, and efficient for teachers to give personalized instruction to students, monitor reading comprehension with automated questions, and track student progress with simple charts and graphs.